The Valus Mountains are a mountain range on the border between Cyrodiil and Morrowind. They meet the Jerall Mountains at the Skyrim border. They are sometimes considered an extension of the Velothi Mountains. The Hero Hill, a secret shrine to Boethiah, and the ruins of Fort Scinia are some of the many landmarks in the region. The mountains are home to several Ayleid ruins, such as Fanacas and Kemen. The city of Cheydinhal is located on the foothills. During the Alliance War in 2E 582, one of the two bases of the Ebonheart Pact was located in the Valus Mountains, along with the Scroll Temple of Ghartok. In 3E 433, a rogue Telvanni wizard Frathen Drothan crossed the Valus Mountains from Kragenmoor in search for the lost Ayleid city of Varsa Baalim, hidden beneath the ruins of Sundercliff Watch. Circa 4E 40, a village called Mountain Watch existed in the Valus Mountains. 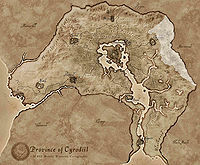 It was evacuated when the undead forces of Umbriel crossed the mountains and invaded Cyrodiil. The Valus Mountains form the western border of two regions of Morrowind, Deshaan and Stonefalls. 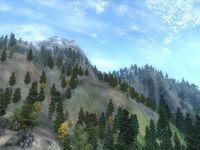 The cities of Kragenmoor and Narsis are located on the foothills.